1.Take you hoody and mask. Pin the mask to the front of the hoody opening and sew it on. Cover the hole as much as you can. 2.Take apart and umbrella. Pin the bottom of the hoody to the top of the umbrella and sew in place. 3.Take the gloves and wire. Measure long pieces of wire to fit in the fingers and wrap them at the base. We want to make each finger have a wire in it, so we can pose the hands. Stuff each finger with some stuffing or torn bits of plastic bag until you have hands that look realistic. 4. pin the hands to the ends of the sleeves and sew in place. 5. using coat hanger wire, bend a long piece in one arm and then across the body and into the other. Stuff arms with plastic bags. 6. Add wire to the legs and stuff legs. Add shoes at the ends. I sewed 2 shoe shaped pillows to the ends. Sew the tops of the tights of socks to the middle of the umbrella. Embellish woith some tulle if you want to make the skirt more full. 7. Poke a hole in the top of the mil jug and thread a long coast wanger wire threw. Put the milk jug into the head part. The top of the wire pokes through the top of the head. 8. Put a wig pon top the the hood, poke the wire through the top... then put on the hat. The end of the wire pokes through the top of the hat, and then ends there with a loop for hanging. 9. The bottom of the wire goes out the front of the hoody and wrap around the broom. Stuff around the head with some more bags to get the head the right shape. The wire will need a bendy knoted spot to keep the head from limping towards the bottom of the broom. Make this bend inside the milk jug. 10. Add a pillow into the body. Zip up the hoody and add some wire at the base of the hoody to hold the witch onto the broom. Add wire at the feet to hold them onto the broom. 11. Arrange the hands onto the broom. They should stay put since they are wired. 12. 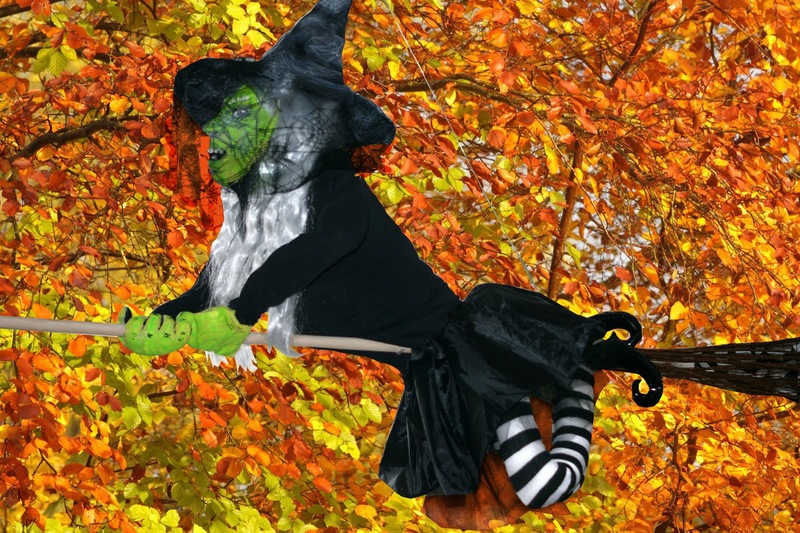 Add an extra support wire from the top of witch hat to the back of the broom. 14. Un-stuff her after halloween and put her in a box. Broom slips out for reuse, or storage.